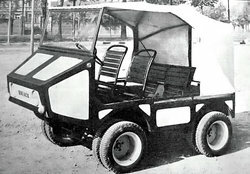 FART (Fabbrica Autoveicoli Rimorchi Torino), based in Turin, launched the engineer Ferrari designed prototype of an off-road vehicle that was presented at the Turin Motor Show in November 1965. Production was never started and the number of vehicles produced were probably only three. This was a tiny cross-country vehicle powered by a rear-mounted Fiat 500 Giardiniera engine. It had extremely simple and strait forward controls with bodywork was entirely open and could seat up to four. Versions were offered with two set of wheels per axle and an extra gear reduction, enabling it to crawl up a 40 per cent gradient and achieve a top speed of 40mph (64km/h).